Last weekend was yet another wonderful one, spent together with my family and taking long walks in the snowy landscape. Yesterday morning, Emilia and I went on a walk before Fredrika woke up, and, since it was getting warmer, the initiative to build a snowman came up before the opportunity would pass. While constructing it, I was seriously doubting if I have ever built a snowman before in my entire life. I must have, right? I’m not particularly gifted with working with my hands (except for playing the guitar and some other things…), I’m more the type of man that just lifts or moves heavy stuff and puts it down again, but still, the work with the snowman didn’t go as smooth as I had hoped. Well, I've built a couple of snowmans in my life, but the funniest part must have been to destroy them afterwards (oh my god, what an aggressive little boy I must have been by then). Now go throw a snowball at someone who deserves it! Why is the snowman wearing a blue coat, is that because in Sweden itÃ¢â‚¬â„¢s so cold the snow doesnÃ¢â‚¬â„¢t stick together correctly? Thus I presume the coat is used to hold it there; as I had heard if the temperature goes below: -20Ã‚Â°C the snow has issues in reformulating itself into a good snowball. Tommy mentioned he used Ã¢â‚¬ËœKrazy GlueÃ¢â‚¬â„¢ to build snowmen but somehow I think that would be rather costly and he probably meant his igloo. 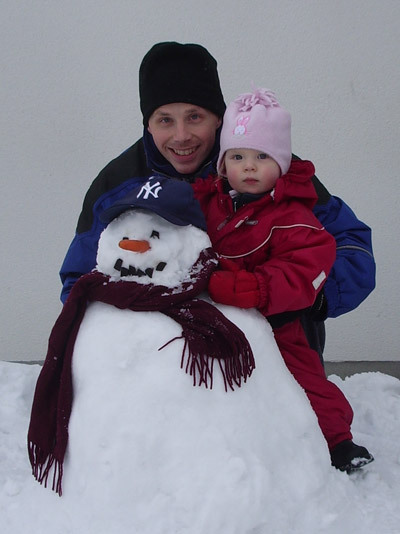 Yes, I've built many giant snowmen even though we don't get much snow here. That's not a snowman; It's just a snowball with a carrot stuck in it! Just kidding, it looks quite fine. I'm really happy that I'm not in Stockholm though. The picture actually makes the weather here in London seem rather pleasant. Actually, it hasn't been that cold here lately, only a couple of degrees minus Celsius, so there was no need for glue. That's a fine looking snowman, Robert. Personally I feel perfection is something that should be avoided when building a snowman – the balls should be not quite round with tufts of grass and patches of mud and the eyes, nose and (possibly) sticks for arms should all be wonky.